Written by Isabella Anderson Turrialba is a beautiful place you must visit when you come to Costa Rica. It is located in the province of Cartago. Prints adorned by temples and historic houses, rivers, coffee and horticultural areas await you if you choose the route of the little towns: Pacayas, Capellades, Santa Teresa, La Pastora and Santa Cruz. Turrialba is the ideal place for those experience adrenaline lovers. A total Costa Rica Adventure waits for you here. You can choose canopy, drive ATV, rappel, the famous Tarzan swing, mountain bike, horseback riding, rafting, paragliding or canoying. You must visit, too, the Turrialba Volcano. The imposing volcano with its brown, grey and oranges colors is accompanied by a strong green from the cloudy tropical forest, surrounded by dairy and agricultural farms… Is just a breathtaking view! During your Costa Rica vacations down Turrialba, one of your favorite Turrialba Tourswould be the visit of National Park Turrialba. 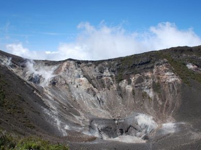 The Turrialba Volcano hosts 2 craters: the central and east one. The central crater activity is maintained constant -with sulfur, gases and water vapor. If you are lucky and you visit it on a sunny day you will be able to watch the Caribbean Coastline and the Tortuguero plains while walking the trails. Also, another amazing tour is the visit to the National Monument Guayabo. It was discovered in 1958 by some farmers in the area, guava contains 232 hectares and 20 protected archaeological sites. It was declared a national Monumet August 1973. You can ask to our Costa Rica Travel Agenc y Travel Excellence for more information. Turrialba is renowned for its cheeses, adventure options and horticultural production but, also, the coffee industry is not far behind. The Costa Rica tours to see the golden grain production invite you into a world between dryers, trunks and fermenting, that way you will know in detail the process that allows every morning drip grind grain and drink a delicious cup of coffee. You can stay in some of the most beautiful Turrialba Hotels of the region, for example: Tayutic, Casa Turire, Wagelia Espino Blanco Logde or Guayabo Logde.